The Royal Challengers Bangalore finished at a disappointing sixth place last season and failed to make the playoffs. They were busy at the player auction and rebuilt their team and were hoping to address the issue with their bowling unit. RCB signed Brendon McCullum, Quinton de Kock, Chris Woakes, Corey Anderson, Moeen Ali, Tim Southee and young spinner Washington Sundar. Neither of the big name signings performed to their potential and left Virat Kohli and AB de Villiers to do the bulk of the scoring. Kohli who finished with 530 runs and De Villiers who finished with 480 runs were RCB's best performers with the bat by a huge margin and Umesh Yadav was impressive taking 20 wickets. The opening batsmen failed to perform and put a lot of pressure on Kohli to score. The death bowling was yet another concern that has continued to plague them across seasons. Neither of their bowlers managed to come up with convincing performances in the death overs. Here are 3 successful international cricketers who failed to perform for RCB. 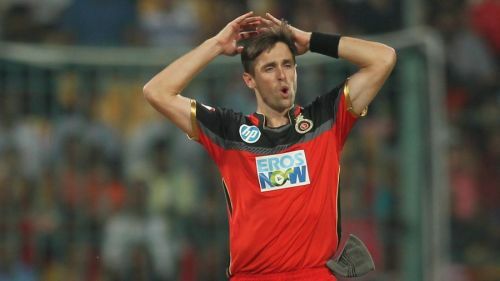 Chris Woakes, the English all-rounder, was part of the RCB side last year. Recruited for his big hitting abilities and quick bowling, Woakes made an impact in the first 2 games taking 5 wickets but later fizzled out and was very expensive. His economy rate was 10.36 bowling throughout the innings and 11.28 in the death overs. He returned to England following the bad run of games nursing an injury and to prepare for their upcoming international matches.